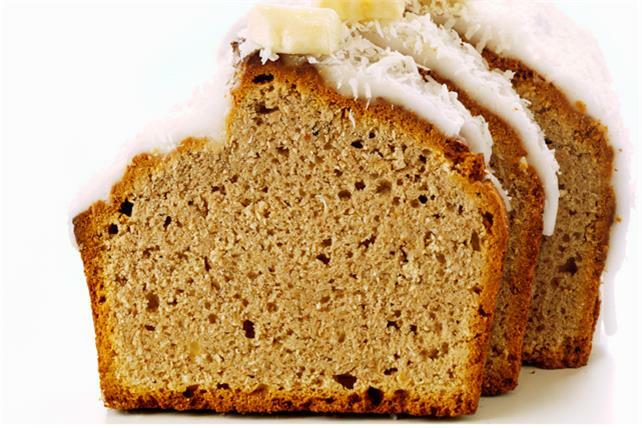 The sweetness of ripe bananas and flaked coconut make this banana bread recipe particularly scrumptious. Combine flour, granulated sugar, 2/3 cup coconut, baking soda and salt; set aside. Mash 3 bananas in large bowl. Whisk in yogurt and egg until blended. Add flour mixture; stir just until moistened. Whisk remaining ingredients until blended; drizzle over bread. Sprinkle with remaining coconut. Chop remaining banana; sprinkle over bread just before serving. Stir in1/2 cup chopped walnuts to the batter before pouring into pan. Stir in 2 oz. chopped Baker's Semi-Sweet Chocolate to the batter before pouring into pan.